After the popularity and the number of conversations I have had about my how to become a fitness tutor post, I thought I should do the same for becoming a fitness assessor. These two roles go hand in hand really, so if you have not read my post on becoming a fitness tutor have a look at that one too! Within the world of vocational qualifications there are two specific roles, the tutor. They teach and guide learning experiences for their learners. Then the assessor is the person who comes along and guides the learner through the assessments that are involved with specific course. They are there to decide if a learner has met an established set of criteria in order to satisfy an awarding body. In the world of vocational qualifications the tutor and assessor may well be the same person and this is only different in work based learning with end point assessment. There has been a great increase in the number of people training to become assessors, this is in line with the growth in the demand for all kinds of fitness courses. It is a very good logical first step into the education side of the fitness world. 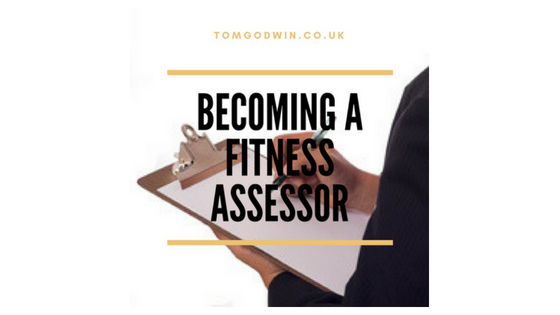 The first step in embarking on a career as a fitness assessor is to get the appropriate assessing qualification. You need to consider what kind of qualifications you will be working with, will they be vocational or work-based. Assessing in each of these areas is slightly different so specific qualifications are needed for the work based, now end-point assessment. There are a number of companies that offer these, across the UK. There is a potential pit falls are that in order to gain your assessors award you need learners to assess. Some providers provide this by letting you assess some of their learners on fitness instructor and personal trainer courses. Whereas others do not, in this case it is vital that you are sure that you have a source of learners to assess. The assessing course itself is not a challenging one for most people there will be a taught element either face to face or on-line where you learn all about assessment practice, governance, practice and much more. This will allow you to complete the worksheet that is normally associated with the principles of assessment unit. You will then go onto shadow an assessor, then be assessed assessing. You will basically be given two learners to assess while being observed to make sure you get it right. You will then be a fully qualified assessor and free to go out there and assess any qualifications you are technically competent in. I often liken passing the assessor test to passing your driving test, like many things in life you have passed a test to show basic competence but you need practice to become any good. My number one tip is to get as many assessments done, or shadow sessions as soon as you can this will allow you to solidify some of your thinking and practice around assessment. 1) A lot of new assessors come in and think they are going to be able to change the world, in terms of standards in the industry. Now I do not really want to get into a debate about what I think about that right now… However as an assessor we are working to a set of criteria that is national and across all centres within an awarding body. So basically if the learner meets those standards you can not refer (what we call a fail) then if you think that they should be doing better. This can be a very frustrating element to the role in places. Making sure you work for a good quality training company will ensure that you have the support you need to make these decisions and in turn hone your skills. 2) The work in this area is no longer that well paid in many places! In the good old days there was a shortage of those qualified and competent to assess in the fitness industry so day rates were relatively good. Over the years there has been an influx of new assessors meaning rates have come down… Basic supply and demand really. It is still a good role and a good step into education… just not as well paid a step as it used to be. 3) If you are just an assessor work opportunities are more limited as most tutors assess their students in the vocational field or swap with another cohort in the same company. So for more permanent work you would need to look at teaching as well. 4) The job is not an easy one you are making decisions about if a learner passes an assessment or not and this can have massive ramifications for their educational journey. You need to be able to make good decisions, give constructive feedback, and motivate your learners to show their very best in the assessment. Assessing is a great job and in all gives you the chance to be involved in a vital capacity in the journey of those entering the fitness industry. You have chance to mould some of their ideas and help them hone their skills. It is a very valuable first step into education based roles and is a massive learning curve for the new assessor too. If you have any questions just type them into the comments section below, use the contact form or reach out on social. Happy to help! Hello, I am looking to trying college lecturing and assessing and would be grateful If you could recommend some good companies to take the qualifications with. There are so many out there and I’m unsure where to go next. Hi Gillian, that is awesome! Shoot me a message on social or use the web form on the site to give me a few details such as your location and an e-mail and I would be happy to offer some advice.